This is a delicious mouth watering dessert I created the other night. I think you will love it. 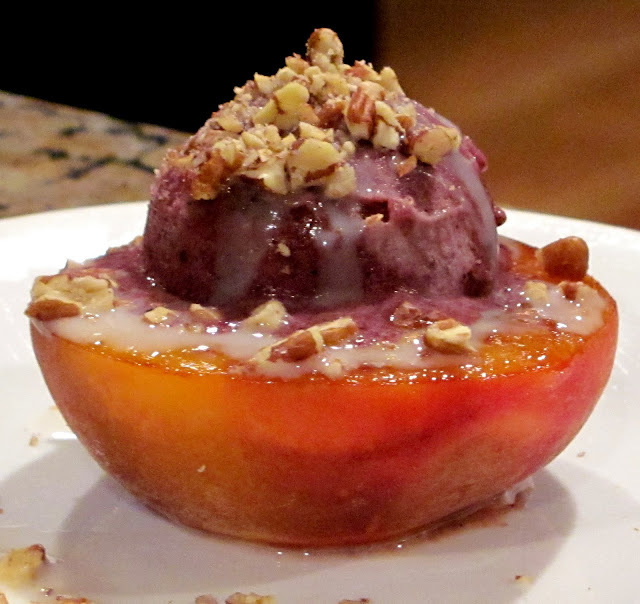 Instead of blueberries you can also use peaches or another frozen fruit of your choice. Cut peaches in half so that one half has the top and the other half has the bottom. Brush peaches lightly with olive oil. Place on grill or frying pan and lightly brown. Blend all ingredients in blender until smooth. Place in ice cream maker and run for about 20 minutes. Place in home freezer until ready for use. Use within a few hours or it will become too hard to scoop. Place 1 scoop of blueberry ice cream on top of peach. Drizzle with 1 tsp. almond milk and add chopped pecans. This looks like something I am going to make. It looks really yummy. It does look totally delicious! I always love fruit paired with ice cream! wow! looks really delicious!! you always create good stuff,I would love them.and this ice cream looks so beautiful yummy!! This looks so good. I love fruit for dessert.